This year, Florida Sea Grant partnered with the Gulf and Caribbean Fisheries Institute, the Sea Grant programs of Georgia, Hawaii and Puerto Rico, and the Caribbean Regional Fisheries Mechanism to start a Gulf and Caribbean Fisheries Exchange Program. The program provides an extended training opportunity to Gulf and Caribbean-based fisheries professionals to promote greater collaboration, synergy, and knowledge sharing among organizations that manage and promote the sustainability of shared Gulf of Mexico and Caribbean fishery resources. The program, now in its seventh year has hosted participants from Dominica, St. Kitts and Nevis, Jamaica, Antigua and Barbuda and Trinidad and Tobago. To apply: Download the PDF application and send to Dr. Charles Sidman (csidman@ufl.edu) or to Dr. Susan Sing-Renton (susan.singrenton@crfm.int) by April 27, 2018. 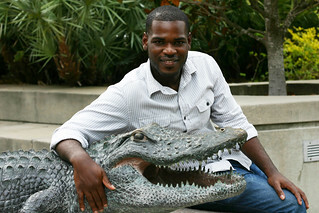 Inaugural Gulf and Caribbean Fisheries Exchange Program participant Randel Thompson is now part of the University of Florida’s Gator Nation. Randel Thompson, a fisheries biologist with the St. Kitts and Nevis Department of Marine Resources, was selected as the first recipient of this new program. Thompson requested specialized training in the application of geo-spatial technologies (GPS and GIS) to help him implement an action plan for the management of a system of fish aggregation devices, known commonly as FADs, that will be deployed in the waters of St. Kitts and Nevis. His training took place at the University of Florida during the spring 2013 academic semester. Anginette Murray completed her four-month stay at the University of Florida as the second participant of the Gulf and Caribbean Fisheries Exchange Program . Anginette Murray, a fisheries officer with the Jamaica Ministry of Agriculture and Fisheries, was selected as the 2014 recipient of the Gulf and Caribbean Fisheries Training Program Award. In 2014, she successfully completed her program at the University of Florida where she completed a graduate-level course in the application of geographic information systems (GIS) technologies using the ArcGIS platform. She applied the concepts and skills learned in the classroom to evaluate the spatial distribution of conch stock abundance relative to fishing pressure on Jamaica’s Pedro Bank. Complementary analyses involved the mapping of government-owned gear sheds and fisher’s cooperatives. Murray returned to Jamaica where she will use her knowledge of GIS mapping to organize and manage fishing infrastructure data, map the demographic characteristics of fishing communities, and enhance outreach efforts. Jamie Herbert, a fisheries cadet, affiliated with the Antigua and Barbuda Fisheries Division, was selected as the 2015 program recipient. Jamie’s training interest involved the development of survey implementation and analysis protocols for the collection and evaluation of catch and effort data from offshore artisanal fishers that use fish aggregating devices. In this way, Jamie’s training program at UF helped to support the Caribbean Fisheries Co-Management (CARIFICO) effort being implemented by the Japan International Cooperation Agency (JICA). Jamie applied concepts and skills learned from graduate-level fisheries management and quantitative methods and statistics courses offered at the University of Florida to update the existing data collection form and to develop skills for analyzing catch and effort data. Jamie returned to Antigua and Barbuda where he acts as the JICA CARIFICO liaison to the Fisheries Division.